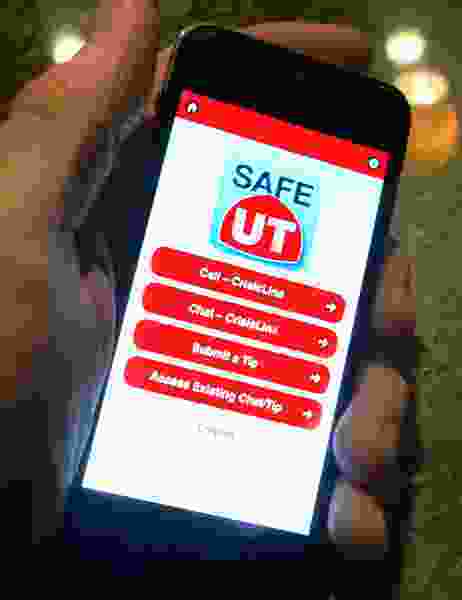 (Steve Griffin | The Salt Lake Tribune) The SafeUT app is a statewide service that provides real-time crisis intervention to youth through texting. Calls to Utah’s suicide hotline and other crisis services continue to increase, but state funding hasn’t grown to match the demand — and it’s creating concern over how long counselors will be able to staff the phones, according to a critical audit released Wednesday. The new report from the Office of the Legislative Auditor General found that the biggest mental health resources in the state, which are offered through the University of Utah, are now operating at a $1 million deficit. That includes a 24-hour lifeline that gets more than 5,000 calls a month and the SafeUT app that puts students in touch with trained therapists. Both are anticipated to get even more use over the next year. “The volume growth will likely go beyond our ability to keep up,” wrote Ross VanVranken, executive director of the U.’s Neuropsychiatric Institute, in a letter responding to the audit. By 2020, without more money and more employees, the report estimates the crisis programs will be $3 million in the red while answers to calls could lag and some people might have to redial to get through. A delay in response could potentially stop someone from seeking help. That’s particularly troubling for Utah, as the audit points out, where the suicide rate has risen 34% over the past decade to be the fifth-highest in the nation. The operations fall under the University of Utah’s massive health care system — which absorbs some of the financial loss. But it’s not necessarily a sustainable model, according to the audit. It cost $99 million to run and staff all of the institute and those crisis programs in the last fiscal year. That’s up nearly $20 million from even two years ago because of the growing need. The U.’s health care network is covering about $8 million a year in IT and human resources expenses for the crisis center. And it’s paying off a $37 million bond that remains after expanding the hospital by 72 beds in 2014. Community partners — including state appropriations, Salt Lake County and the Utah Division of Substance Abuse and Mental Health — contribute about $6 million combined each year. Still, the crisis programs are falling short of covering their expenses at the same time the demand for those programs is surging. Calls to the hotline saw a 29% bump over the past two years. Messages on the SafeUT app spiked by 1,081%. That program is used by all public secondary and higher education schools in the state. In March, there were 2,300 chats and 233 tips regarding concerns about someone experiencing suicidal thoughts. There was follow-up on each of those, including 25 with in-person safety checks. Lawmakers have appropriated money to the app as part of a larger effort to address youth suicide in Utah, which has one of the highest rates in the nation. In the 2019 session, they designated $1 million to cover the costs. Overall for the crisis services, the funding is not growing as fast as the demand. Without the U. 's contributions, for instance, the institute would be more than $30 million in the hole. The app and hotline will likely have even more use as counties outside of Salt Lake phase out their individual numbers by the end of this year and refer everyone to the main lifeline at 1-800-273-8255. It could be compounded further if national efforts to create a three-digit number (akin to 9-1-1) for those in a mental health crisis move ahead. Right now, the staffers who answer Utah’s calls try to pick up within 24 seconds. But even that is only happening 50 percent of the time, according to the audit, because of the volume. And the requests for help are getting more severe. VanVranken, who has directed the neuropsychiatric institute for 29 years, said he’s looking for more community partners to cover the costs and needs the state to designate more funds, as well, so he can hire extra counselors. The university has also brought in a management consultant to address staffing decisions and implement the recommendations from the audit. “There is a lack of resources for mental health,” VanVranken added, which can’t be fixed without more people trained to respond to crises. The report was sent to the public education appropriation subcommittee to review how to finance the services. Originally, the audit was requested to look into concerns that staff at the institute were admitting uninsured patients and those on Medicaid at lower rates and that doctors were favoring certain care centers in their recommendations. Neither of those were founded, Kidd said, or validated in any way. But the university is doing all it can, the audit said, to address a growing issue with limited resources. If you or people you know are at risk of self-harm, the National Suicide Prevention Lifeline provides 24-hour support at 1-800-273-8255.